Sapna Cheryan has spent much of her career researching the stereotypes that contribute to male-dominated science and technology fields. She’s traced those ideas to childhood, to the toys boys and girls play with and to the beliefs they form about who programs a computer and who feels at home in a lab. So when Mattel in the spring asked Cheryan, an associate professor of psychology at the University of Washington, to advise on its most iconic toy – the Barbie doll – it felt, somewhat ironically, like an opportunity. “If there’s a way to influence children, it’s through a toy,” Cheryan said. “Toys are really important. The first way kids get experience with different fields is through toys, like a toy microscope. But the toy market is very gender-segregated. Physics toys and dinosaurs are still seen as boys’ toys. The Barbie Global Advisory Council is made up of 12 people from a range of occupations who serve a one-year term to, as the company puts it, “act as a collective sounding board for the brand.” Mattel picked Cheryan because of her research on diversity, stereotypes and gender gaps in STEM, all of which will “help inform and refine Barbie brand initiatives” around career-themed dolls and related items, according to a statement from the company. Women are underrepresented in many STEM fields, especially computer science, engineering and physics. According to a 2017 study led by Cheryan, women earn 37 percent of STEM degrees in the United States, and 18 percent of computer science degrees. This year’s Barbie Council includes other experts in STEM-related fields, as well as culture and identity, such as Andrei Cimpian, an associate professor of psychology at NYU; Emily Calandrelli, host of the Xploration Outer Space TV show; and Kevin Clark, director of the Center for Digital Media Innovation and Diversity at George Mason University. See a related story in The Seattle Times. The Barbie line has expanded in recent years, with dolls of different body types, skin tones and hairstyles, and career and “role model” dolls that represent various professions and famous women and girls (Olympic gold medal snowboarder Chloe Kim is among the latest). Even Ken has had something of a makeover, with more than a dozen versions of the doll. And in June, the company introduced a new career doll: robotics engineer Barbie, which comes with its own online coding lessons. But Barbie’s transition hasn’t been entirely smooth. Customers were quick to criticize an early version of computer engineer Barbie, which, in its companion storybook, turned to two boys for help in fixing a laptop. Another edition of scientist Barbie wore a not-lab-ready short skirt and high heels. The advisory council was formed in 2015 and is meant to steer the brand into the future, according to Mattel. Council members receive $10,000 for their service. 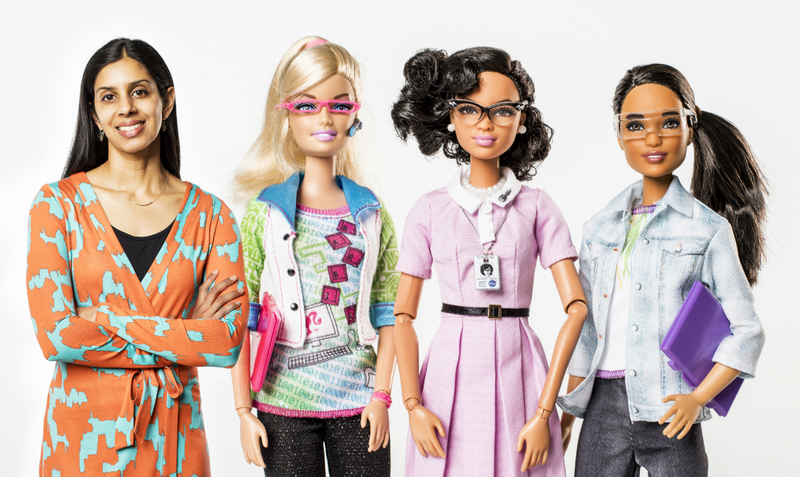 The company’s continued efforts to evolve the toy swayed Cheryan, who has in her office computer engineer Barbie, which was a gift from a friend, and a doll representing Katherine Johnson (a NASA mathematician made famous in the film “Hidden Figures”), which was a gift from Mattel. Much of Cheryan’s research, involving both children and adults, has examined how cultural beliefs about STEM shape an individual’s own sense of identity and belonging. One co-authored study, for example, focused on exposing young children to robotics through toys. In that experiment, 6-year-old girls who programmed a simple animal robot were more likely than girls who played a card game to express interest in technology and confidence in their programming skills. Another study redesigned a hypothetical computer science classroom, and asked teens to indicate how likely they would be to enroll in each version of the class. One classroom featured action figures on the desks and Star Trek and video game posters on the walls, while the other room was decorated with plants and art. The study found that girls were less likely to enroll in the stereotypically “male” classroom. Whether a Barbie dressed as a robotics engineer can influence a girl’s future career choice remains to be seen, Cheryan added. With research that shows the impact of changing the environment of a classroom or workspace, she said, a toy can be part of that. For more information, contact Cheryan at scheryan@uw.edu.